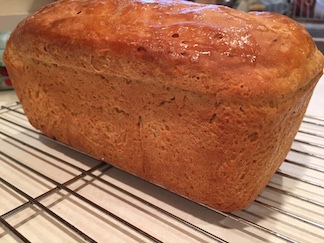 This is a pic of the resulting baked loaf - it was delicious! But it was also very delicate, and the top of each slice kept separating from the bottom, i.e. falling apart. I may have done something wrong, but I did follow the recipe exactly, so not sure what happened...anyway, I have enough flour left over to make a few biscuits to go with tonight's plant-based chili (Bill's FAVORITE CHILI), so I'm going to just get into the kitchen later and let Ruach lead me...that always seems to work best, anyway! I'm just make a small batch recipe for 'buttermilk' biscuits. I don't actually have buttermilk (I'd only have raw, cultured goat milk in the house anyway - which is impossible to find around here)...so I'll use almond milk with a bit of either apple cider vinegar or lemon juice in it...I have about 1 1/2 Cups of einkorn flour left from my first baking venture - the sandwich loaf, which I made it for a friend. We did taste some, and it was very good, it was nearly impossible to slice without it crumbling! 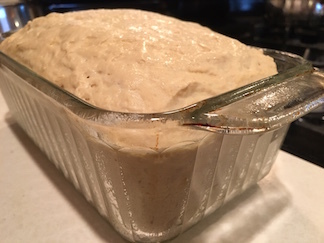 I did put the dough on the stove to rise while the oven was on, so it might have 'forced' the yeast...I"m thinking this could cause the bread to fall apart, too. Later I'll be posting my biscuit recipe if they turn out - keep checking back! Thank everyone who has prayed for this outreach ministry and sent in gifts to support our Work for the Messiah - bless your hearts!!! I'm working up to making some Challah Bread for Sabbath soon!